Do you ask yourself why it is so hard for your students to remember the bossy "e" rule? Do you get tired of saying this all of the time? "Remember if the word ends with an "e," then the vowel says its name." We do a lot of activities in my classroom trying to work on this strategy. Here is one game I created with my class. First you match the cards (12 cards = 6 matches) that look similar to each other. You will have one card with a black dot and one without that makes a match. 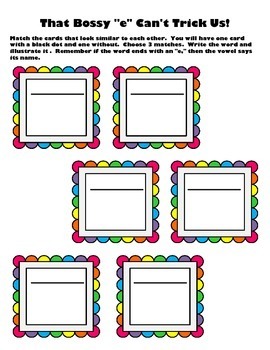 Choose 3 matches and illustrate them on the activity sheet provided. We do this game in literacy center groups, and they love it.